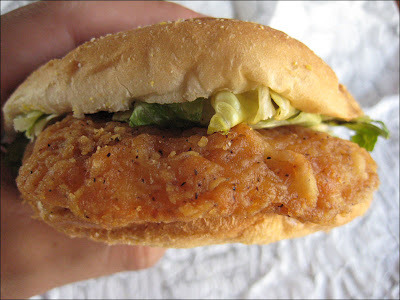 Straight off of the KFC value menu (only available in the Los Angeles area so far) is the Original Recipe Chicken Sandwich. 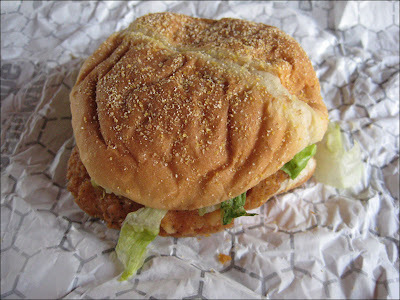 The sandwich features a decent-sized chicken patty breaded in the Colonel's Original Recipe seasoning and served on a warm bun with lettuce and mayo. 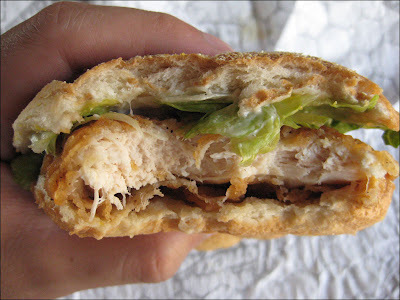 It would have been okay if the lettuce wasn't soggy without any hint of crispness. In fact, the lettuce was so soggy it was a bit chewy. 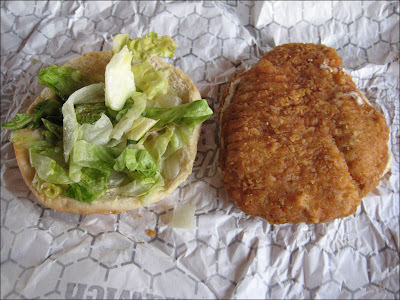 I have to say the poor state of the lettuce ruined the sandwich for me. If you live in the LA area and order it, be sure to cross your fingers for fresh lettuce. 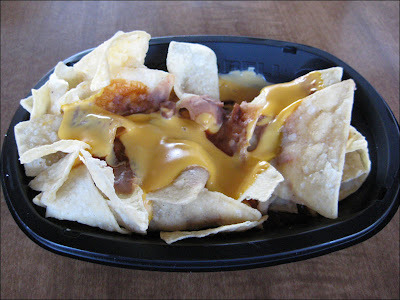 Taco Bell's Triple Layer Nachos are pretty decent deal for all of 79 cents. I think it's best if you have some change in your pocket and just want a simple nacho snack. The three layers are nacho cheese, refried beans, and a red sauce. They work pretty well together. One of the better items off of the value menu. 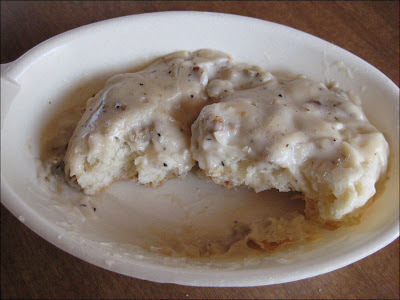 For a bit more than a dollar, a fluffy biscuit smothered in sausage gravy. I liked this item the most out of all the breakfast items I've tried off of Wendy's recent (only at participating locations, I think they're still testing it out or only making it optional for franchises) breakfast menu. 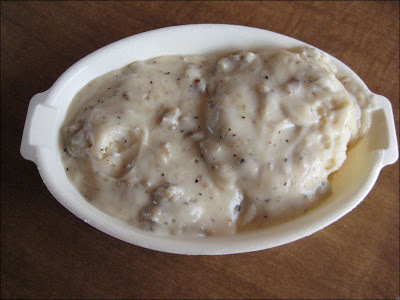 It's not much to look at but the gravy had a creamy, peppery flavor and little bits of sausage that complemented the biscuit well. 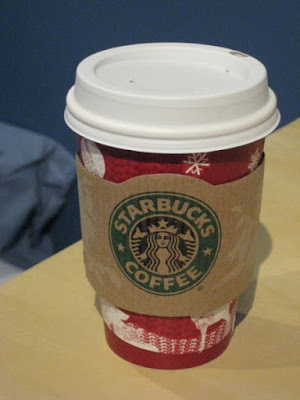 It was on my way home, so I stopped by my local Starbucks to get a free Tall-sized cup of brewed Pike's Roast Coffee on Election Day. It tasted a bit burnt but I drank it all, so it wasn't all bad. 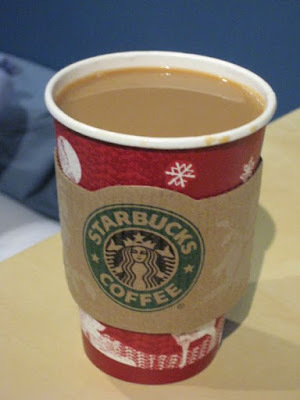 I think the only coffee drinks I like at Starbucks are the bottled Frappuccinos or a Caffe Latte. It's only early November, but it's beginning to feel a lot like Christmas. 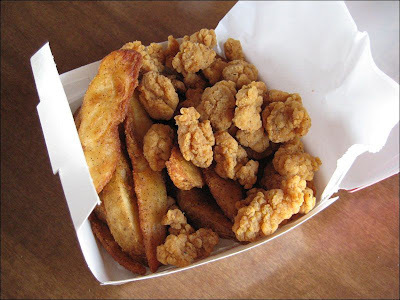 KFC's Popcorn Chicken Snack Box features Popcorn Chicken and Potato Wedges in a tidy little box for $1.99. It is part of their Value Menu. I've always been a fan of KFC's potato wedges and these didn't disappoint. The Popcorn Chicken on the other hand, is more batter and breading than chicken. 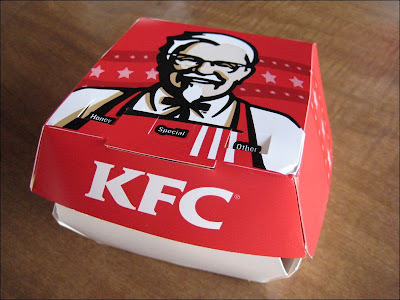 Honestly, it seems like one of the marketing wonks at KFC thought, "Hey, we have all these little bits and trimmings from our chicken that we just throw away... Why not just dip them in batter, fry it, and sell it!" They're selling us their leftovers! So, yeah, I'm not a fan of KFC Popcorn Chicken. I've had pieces that were entirely just fried batter and no chicken. Now that I think about it, some people might prefer it! As for me, gimme chicken please! Today, November 4th, 2008, Starbucks, Krispy Kreme, and Ben & Jerry's are offering free food or drink as an incentive to vote. 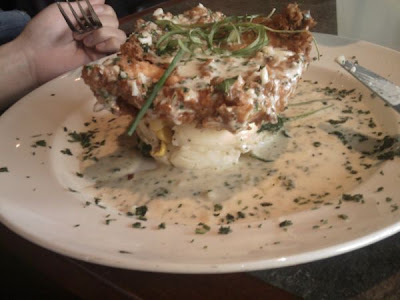 Interesting presentation: a very sizable boneless, skinless chicken breast served atop a mound of spinach, corn mashed potatoes in a lake of creamy gravy. About 16 dollars. I would suggest getting the gravy on the side as the chicken loses some of its crispness otherwise. 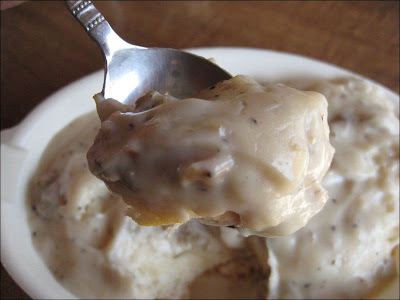 Still, it wasn't soggy from all the gravy on top and was quite enjoyable. The mashed potatoes were particularly interesting and I mean that in a good way; you could taste the corn and spinach in a bit of a vegetable medley.